High quality enamel finished.Constructed of durable aluminum alloy and plastic frame.Its brightness is dimmable with dimmer. LED as its light source,no flickering,no eye fatigue,energy saving,long life time.High quality imported LGP acrylic panels, translucent and durabale, not easily deformed or discolored.With the function of automatic switching-on upon film-inserting. 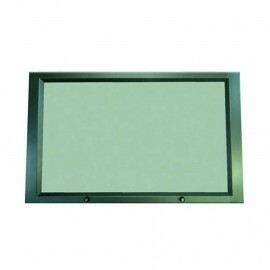 High quality enamel finished.Constructed of durable aluminum alloy and plastic frame. Its brightness is dimmable with dimmer. LED as its light source,no flickering,no eye fatigue,energy saving,long life time.High quality imported LGP acrylic panels, translucent and durabale, not easily deformed or discolored.With the function of automatic switching-on upon film-inserting. Light Way:from Edge-lit 2 sides. LED Type and qty: SMD2835.